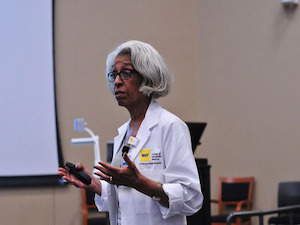 When Arkansas State approached the New York Institute of Technology (NYIT) about starting an osteopathic school of medicine, Dr. Barbara Ross-Lee was one of its biggest supporters. “Fundamentally, it kind of captured my motivation in medical education and health care,” says Ross-Lee, who now serves as dean of the school, which welcomed 115 students this fall. She is also vice president for health sciences and medical affairs at NYIT. When comparing all 50 states, research shows Arkansas has one of the largest shortages of physicians and lowest population health statuses. It’s been dubbed one of the sickest states in the union, Ross-Lee says. At the helm of the new school, she seeks to raise those numbers using her passion for health care equality and experiences of overcoming as the underdog. After Ross-Lee entered Wayne State University pre-med, she received a discouraging piece of information. Her White, female adviser “didn’t think women or minorities should pursue medicine,” she recalls. “But that was not usual at the time,” she adds, noting that opportunities in the medical field for people like her were slim in the 1960s. Thus, she pursued chemistry and biology majors, earning a bachelor’s degree in 1965. She then found a position working at an osteopathic hospital. This was her first encounter with this type of practice, which trains doctors to use a more hands-on and holistic approach to healing. Through the National Teacher Corps, she advanced her studies, earning a master’s degree in education from Wayne State. For the next few years, she taught in K-12 classrooms in Detroit, where she grew up. Then, following the height of the civil rights movement, Michigan State University opened a new osteopathic medical school. “It was kind of an interesting time in my personal life — I had to make a decision as to whether I wanted to continue to teach K-12 or pursue my dream of becoming a physician,” she says. She chose the latter, earning a D.O. in 1973. For years, she ran a family practice in Detroit where she encountered many low-income and minority people who struggled to get quality health care. It’s “always been my passion to provide the best access that I could to the patients who were part of my practice,” she says. In 1978, she joined the faculty at Michigan State’s College of Osteopathic Medicine. By 1990, she’d climbed the ranks to associate dean for health policy. She also served as a commissioned officer for the U.S. Naval Reserves Medical Corps from 1982 until 1994, earning the rank of captain. In 1991, she became the first osteopathic physician Health Policy Fellow of the Robert Wood Johnson Foundation. Although she was told that she wouldn’t be accepted and “it was a waste of time,” she got in and served as legislative assistant for health for Sen. Bill Bradley-N.J. This experience also prompted her to create a fellowship program for osteopathic doctors to learn about health policy. Many of the program’s alumni have helped to make osteopathic medicine “a player in health care policy,” she says. “That’s the thing I’m most proud of,” she says. After the RWJ Foundation Fellowship, Ross-Lee was recruited to become dean of Ohio University’s College of Osteopathic Medicine. “I had never had any aspirations to be a dean, but I thought I would just check into it anyway,” she says. Since Arkansas’s osteopathic medicine program is an extension of NYIT, the schools will link through technology. Students from both campuses participate in lecture classes through video conferences at the same time. In addition, students are able to communicate through social media. Scholarly efforts and research focuses on population health so that students will have a better perspective on how to engage issues even as primary care physicians. “And we’ll be able to monitor those strategies that have the biggest impact of improving the health status of populations,” she says. Students will also interact with people in underserved rural communities by reaching them via medical vans. They will perform assessments and promote wellness and health. Ross-Lee also has plans to create pipelines for high school and college students, particularly underrepresented minorities, because “part of this challenge to increasing the diversity of the medical physician workforce is having more underrepresented minorities as part of that pool,” she says.